Welcome to the third edition of my blog, Annabel Lee. What colour is Wednesday? You may be surprised to learn that it is purple. Quite obviously that means evening bags. So, in honour of Wednesday, here are a couple which I prepared earlier…. Many of the beads in this first little one are Swarovski crystal, one of my favourite things. The medium dark filling in the lace sections in the lower part are comprised of precisely 1,267,098 French knots. 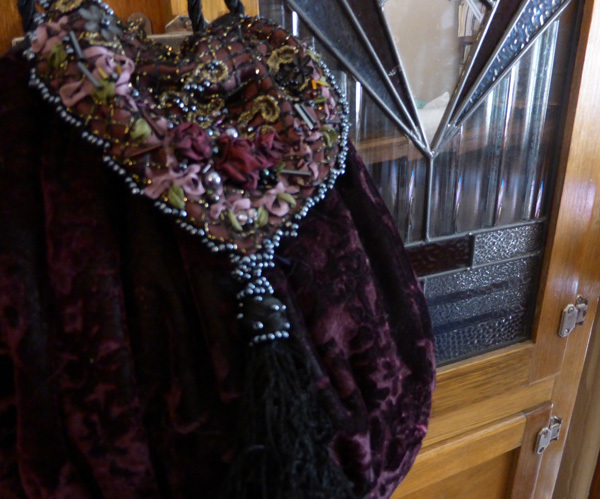 This second bag is a lovely soft bouncy embossed velvet netted beaded beribboned thingie. The Tarot card which I have chosen for today is my card, the Page of Cups. Concentrating on the question of why Wednesday is purple (not really) produced the VI of Swords. Scary to see a sword! But we can relax. Purple Wednesday is safe. The meaning of the combination is that today we will be working at something behind the scenes. There will be a blockage in something which we can overcome, but beware of falling for an illusion or mere fancy.